Satan's number one weapon is deception. The Church's number one need is discernment. The Discerner will take you on a journey of discovery into God's revelation for us today! discernment. And every Believer needs to use them! In fact, without discernment and sensitivity to the Holy Spirit, we cannot progress in our use of any of the gifts and callings. With clear explanations, Scriptural illustrations, and real-life contemporary stories, Goll demonstrates how we can receive revelation through the natural senses of sight, hearing, touch, smell, and taste--and how to open ourselves up to the comparable supernatural senses through which God wants to speak. He also removes uncertainty about how to discern revelation and test the spirits, so that every Believer can fulfill their ultimate purpose: extending Jesus' powerful Kingdom on earth. The Discerner is both a wonderful introduction to the prophetic lifestyle and a challenging call for those already immersed in prophetic revelation. "I want to do more than hear a word from God. I want to become that word. That is revelation's ultimate purpose-for the Word to become flesh." "When I think about my friend James Goll, I think of a man without compromise, a man without guile. He reminds me of the prophet Daniel in the Scriptures because he is single in focus and a man of integrity. His life, in good times and in bad, seems to be a prophetic parable of God's limitless grace working in the life of His servant. This servant of the Lord is also one of the finest students of the Word I have ever met. His pursuit of all that is true seems to attract insights and revelation in a measure that is not normal for most of us. James Goll's passion is to make it practical, and then give it all away. 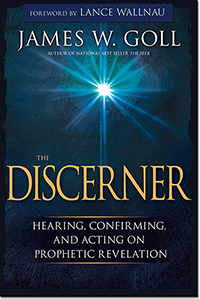 I believe the book The Discerner is a gift from this prophet to the Church, and much like his book The Seer, it will mark the Church for decades to come. Read, enjoy, and be inspired, equipped, and empowered for such a time as this." "I have known James Goll for over a decade. My friend and, even more, this friend of God, is known for combining three strands of truth together in whatever he does. James brings a weight of Scriptural teaching to produce a solid foundation. He then builds upon this by adding a second component to precedents found in Jewish and Church history. This is followed by a third necessary ingredient of contemporary testimonies of the work of the Holy Spirit today. James has done it for us once again in The Discerner. What an excellent handbook to help Believers in Messiah know how to live a supernatural life with effectiveness today." With great joy, James has shared Jesus in more than 50 nations teaching and imparting the power of intercession, prophetic ministry, and life in the Spirit. In the spirit of revival and reformation, James desires to facilitate unity in the Body of Christ by relationally networking with leaders of various denominational streams. His passion is to "win for the Lamb the rewards of His suffering." Praying for Israel is a burden of his heart, as Israel fulfills her role in the consummation of the ages.